F ew paintings capture the hustle and bustle of late 19th-century Paris more powerfully than Gustave Caillebotte's La Rue Halévy, vue du sixième étage, 1878. Created as the city underwent a dramatic reconfiguration, this expansive urban view epitomises the way in which the Impressionists brought the French capital to life, rendered in Caillebotte’s own innovative pictorial style. An elevated vantage point, plunging perspective and clear draughtsmanship characterise this radical and daring composition – among the artist’s greatest contributions to Modernism. As this enthralling scene comes to auction in May, it represents a rare chance to own a great urban landscape that captures the essence of the romantic city that holds our imaginations to this day. Caillebotte uses the embrasure of a window on the left-hand side of the canvas to explore the confrontation between interior and exterior spaces. 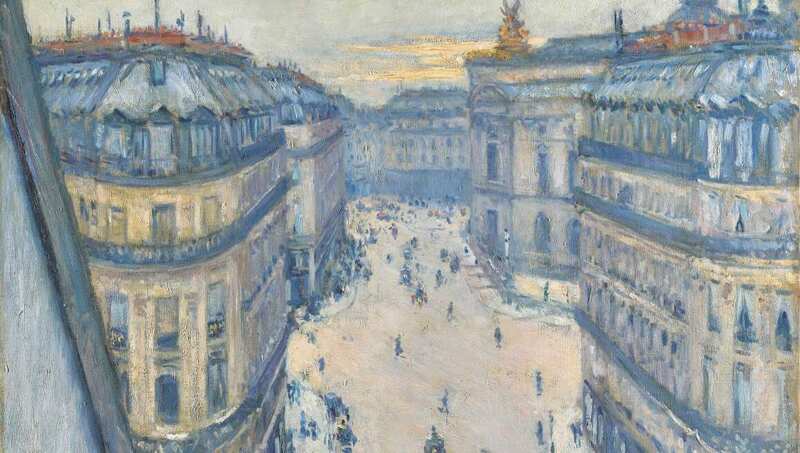 Lively, expansive boulevards were at the heart of Baron Haussmann’s designs for Paris, and here Caillebotte captures the essence of the renovated city. The elevated views offered by the city’s new apartments and their balconies allowed artists such as Caillebotte to easily manipulate perspective in their work. The winged statue in the distance – sculptor Charles Guméry’s L'Harmonie, 1869 – sits atop the Palais Garnier, Paris’s leading opera house, which was completed in 1875. Caillebotte mixes old and new approaches to painting, offering a realistic insight into daily life in Paris while employing modern devices such as loose brushstrokes and a light palette.